Not a long-term solution, but a temporary fix, allowing to use the TeX Distribution system pref panel to switch texdist structures if need be. For example, to switch between the 32-bit binaries in TeXLive-2009 which makes /usr/texbin a symlink to /usr/local/texlive/2009/bin/universal-darwin, and the 64-binaries in TeXLive-2009-64 which makes /usr/texbin a symlink to /usr/local/texlive/2009/bin/universal-darwin-64. 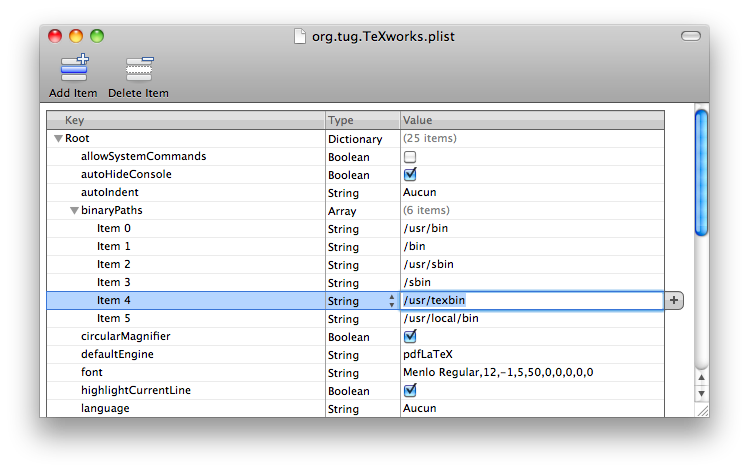 In any case, they do not seem to have any associated entry in the preference file ~/Library/Preferences/org.tug.TeXworks.plist.